Tire forensics is the methodical analysis of failed tires in order to identify the causes of a tire's disablement. By using the laws of physics, math, chemistry, and engineering - mixed with real-world tire background and experience - tire forensic experts determine the most likely events that led up to and caused a tire to fail. Tire Forensic Investigation: Analyzing Tire Failure covers the many ways that a tire can fail, and shows how to identify that failure. Based on the author's 30 years of experience in the tire industry, the book looks at the methodical, physical, visual and tactile examination of the failed tire and identifies the various failure modes for passenger car and light truck tires. 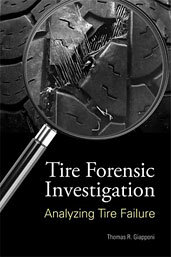 If you do not have access to SAE MOBILUS via username/password or institutional access, you can still purchase the Book, Tire Forensic Investigation.